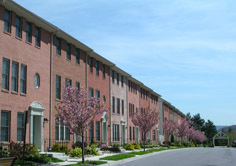 Holliday Hills is a multi-phase, multi-use development covering approximately 130 acres in Hollidaysburg Borough. Holliday Hills, a Limited Liability Partnership, contracted P. Joseph Lehman, Inc., Consulting Engineers to perform engineering, environmental, and surveying services for the Holliday Hills development. Designs have included over four miles of proposed roadway and nearly three miles of new sanitary sewer and water distribution systems. All storm drainage was designed as enclosed systems with no open swales, and detention system designs have utilized oversized storm drainage pipes to eliminate unsightly detention ponds. Surveying services provided by Lehman Engineers have included conventional topographic surveys, boundary surveys, development of survey control networks throughout all development phases to enable efficient and accurate construction stakeout and as-built surveys for roadways, utilities, and housing units. Wetland areas were identified through field delineation and designs were modified to avoid/minimize impacts to these areas. Required encroachments were permitted through Pennsylvania Department of Environmental Protection. Approvals obtained have included: Sewage Facilities Planning (Borough and Department of Environmental Protection), Zoning and Land Development (County and Borough), Erosion and Sediment Pollution Control Plan and National Pollutant Discharge Elimination System (NPDES) Permit (County Conservation District) and Highway Occupancy Permit (Pennsylvania Department of Transportation).